Recorded on July 10-13, 2018 at Fantasy Studios in Berkeley, CA. Copyright 2019 Post-Haste Reed Duo and Aerocade Music. 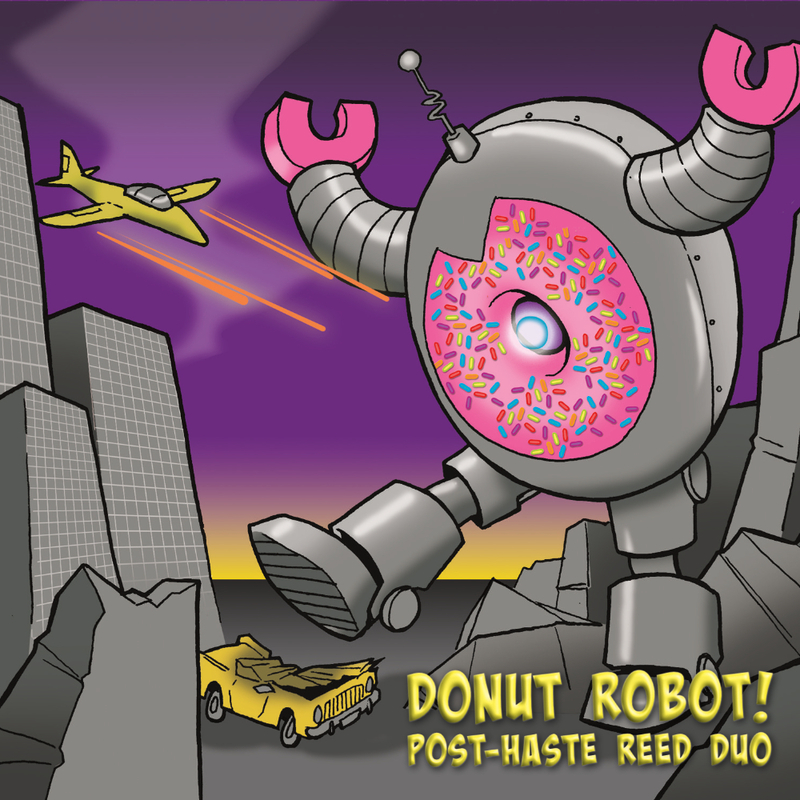 Post-Haste Reed Duo’s sophmore release, Donut Robot!, is an important addition to the saxophone-bassoon duet literature. The six new pieces explore the many possibilities of the unique instrumental pairing while delving into a completely new sound world. With pieces by Edward Hines, Drew Baker, Andrea L. Reinkemeyer, Takuma Itoh, Michael Johanson, and Ruby Fulton, Donut Robot! showcases virtuosic playing, subtle musical shading, and masterful interpretation. Inspired by an autocorrect error, the title of Donut Robot! represents the instances when technology fails and hurts society. The second part is drawn from real news stories in which technology fails. Fulton uses an elaborate method of assigning pitches to speech rhythms to create a piece that is metallic, mechanistic, and fun. First Light is an exploration of microtonality with harmony at very close intervals. The undulating texture is constantly changing and the work, despite its uniformity of texture, ends at a very different place than its beginning. Johanson’s expressive Soundscapes was inspired by the beauty of two very different landscapes – the lush hills of southern Italy and the mysterious snow-covered beauty of Oregon. The final movement is an energetic romp that is as much a treat for the listener as it is a challenge to the performers. Hines takes the listener to the day in 1936 when Belá Bartók and A. Adnan Saygun visited a village in Turkey and recorded 13-year-old Hatice Dekioğlu singing a folk song. He casts the song for soprano saxophone and bassoon and includes the wax cylinder recording of Miss Dekioğlu as the work reaches its touching climax. With a title inspired by a line from a poem by Christina Rossetti, the reverent in the speaking silence explores the peaceful world of quietness and is dedicated to the memory of the composer’s mother. Formed in 2009, PHRD has grown to become a fixture in the new music community, enjoying a robust touring career appearing at universities, festivals, conferences, and concert halls throughout the United States and Canada. As of 2019, Post-Haste has commissioned acoustic and electro-acoustic works by over one dozen composers. The duo released their first album, Beneath a Canopy of Angels...a River of Stars, in 2016 on the Aerocade Music label, which earned warm reviews from press including textura, I Care If You Listen, Fanfare Magazine, and Gapplegate Classical-Modern Music Review. Their second album, Donut Robot!, is set to release on February 15th, 2019. PHRD has spoken and performed at classical and new music’s most prestigious gatherings, including those of the College Music Society, International Double Reed Society, North American Saxophone Alliance, the Society for Electro Acoustic Music in the United States, and the Hawaii International Conference on Arts & the Humanities, among others. 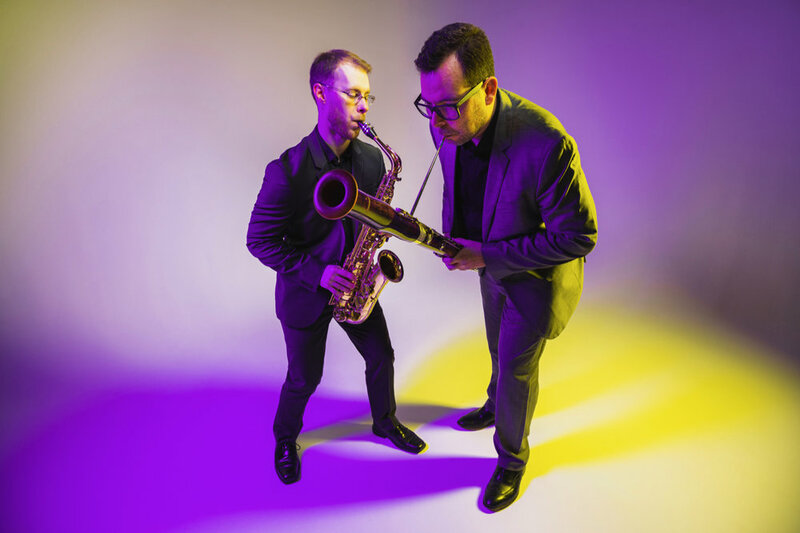 Post-Haste Reed Duo is currently based in Portland, Oregon. Learn more at posthasteduo.com.